The FLUXUS G721 is a technological breakthrough in the ultrasonic clamp-on volume and mass flow measurement of gases. With its state-of-the-art hardware design and powerful digital signal processing it surpasses any other non-intrusive ultrasonic gas flowmeter in terms of accuracy, reliability and versatility. Highly sophisticated signal filters, faster than ever processing capacities and advanced measurement algorithms make the FLUXUS G721 gas flow meter the standard setting measuring solution for any industrial application - even for the most challenging ones. The meter adapts itself automatically to the respective measurement conditions and compensates for flow profile disturbances such as beam dispersal and structure-borne noise, allowing for even more precise and reliable measurements. Extreme fast measurement cycles enable precise real time monitoring of highly dynamic processes. The FLUXUS G721 offers non-intrusive flow measurement of virtually any kind of gas (from natural gas to process gases) over a wide pipe diameter range (from 0.25 to 80 inches), independent of wall thickness, material and internal pressurization (no maximum pressure limitation and starting from as low as 45 psi at steel lines and below atmospheric pressure at plastic pipes). Even hot gas up to +390°F isn't a challenge for the FLUXUS G721 gas flow meter. Besides its advanced signal processing and evaluation technology, FLEXIM takes special care within the manufacturing process of the flow meter, ensuring highest precision and reliability. To achieve true zero point stability, FLEXIM carefully matches each ultrasonic transducer pair according to their individual characteristics. Due to unique transducer built-in temperature probes, the FLUXUS G721 automatically detects and compensates temperature differentials between pipe and transducer, ruling out measurement drift (ANSI/ASME MFC-5.1.-2011 regulations). Also, every transducer and transmitter is factory calibrated guaranteeing specified accuracies and ensuring highest traceability and flexibility. 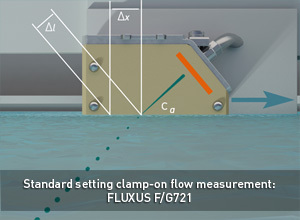 Furthermore, the FLUXUS G721 shares all common advantages of our FLUXUS clamp-on flow meters in terms of ease of installation, non-existent maintenance efforts and unrivalled cost-efficiency. As the flowmeter of choice for a very wide range of applications in virtually any industrial sector, the FLUXUS G721 is available with two different enclosure types: aluminium for standard applications and stainless steel for operation in hazardous and highly corrosive environments (FMc Class I, Div. 2 certified). Further value is added by the meters advanced selfmonitoring capabilities and the possibility of event driven data recording. The flow meter is permanently controlling the quality of the measurement. Such values, but also every other measurement data as well as externally fed in data, e.g. pressure and temperatues, can be chosen to trigger free defined meter functionalities. For instance, in case the quality of the measurement is falling below a predefined value, a temporary recording of high resolution measurement data can automatically be started. Such free configurable event based trigger functionality is not only perfectly suited for measurement diagnostics, but even more for the accurate monitoring of processes as well as the supervision and control of critical operations.